Once again I am at the French Perl Workshop aka Journées Perl. This year the Workshop is taking place in Strasbourg – the capital and principal city of the Alsace region in eastern France and is the official seat of the European Parliament. 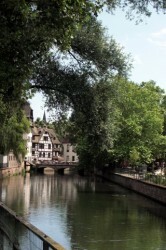 Strasbourg is a lovely City of approx a quarter million inhabitants. 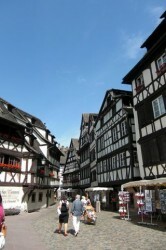 As I am sure you are aware Strasbourg has been under French and German rules several times during its very turbulent past. It is very difficult to go further East in France when you are in Strasbourg. 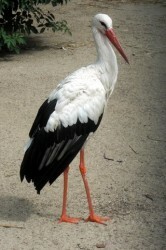 The storks – unfortunately they do no longer adorn the central buildings but you can see hundreds of them in the Orangerie. Descriptive street names: Rue des Dentelles (Laces Street), Rue des Tonneliers (barel makers street), Rue des Charpentiers (Woodworkers Street), Rue des Serruriers (Locksmiths Street) etc. I am told that Strasbourg hosts one of the nicest Christmas market – something to think about for the future. David Morel (‎dm‎) – ‎Big Data en perl‎ reminded me that I should make people aware of our forthcoming Strata conference in London in October. Sorry that was in French. 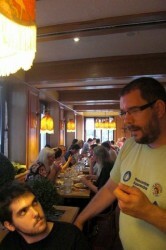 Nothing breathtaking was announced – all the talks were about well-known subjects such as Perl 5x, Perl 6, DBIx etc. The organizers were a little afraid that a conference outside of Paris would be a number catastrophe – not this time, there was a lot of delegates and also a lot of new blood. Students came and showed a lot of interest in Perl and hopefully will continue to do so. And now for something not so new! After dinner, a select few ended up in a lovely park. You guessed this was Chartreuse time! The French Perl Workshop tradition organized by Philippe Bruhat (aka BooK) is to drink Chartreuse, late at night in a public area – nobody knows if it is legal but who cares. Chartreuse is a liqueur made by the Monks of the Ordre de Chartreux since mid 1700s. It is composed of distilled alcohol aged with 130 herbal extracts. The liqueur is named after the Monks’ Grande Chartreuse monastery, located in the Alps in the region of Grenoble in France.